Finally! It has arrived. My day off. And so far, it is pure bliss. My chef shoes have been kicked off for a couple of days and I can actually breath a little. I've slept in until 1:30pm and I'm now settling in with a large pot of coffee and a little Bruce Hornsby playing in the background. Ready to write this one out. A opening note to those of you that haven't been keeping up with the facebook posts: I've been working from 8:45am each morning to about 12:30am each day, after a 45 minute commute home via subway, bus, and walking feet it's about all I can do to pull my self up the stairs to the apartment - hence the lack of posts. I apologize and will do my best to fill in all the details of the last 5 days. This will be one of two posts for the next 6 days, it's pretty long, feel free to take your time reading it. 1) I was not nor will I be able to take any pictures (with the exception of pictures I will take of the food when I eat dinner at the end of my stage). This is not because they do not allow me. I could easily pull out my camera and set up a few nice shots. It is simply because I am there to work, and if I'm taking pictures, I'm not working. I can't justify taking the time to take some pictures while 30 other cooks around me are heads down, working their hardest to get the prep done. I have provided some pictures here - they are not my own. I just thought they would provide some help for those people that have trouble picturing the descriptions. I will however do my best to make the descriptions as vivid and detailed as possible. 2) Because the past five days have been such a flurry of new foods, techniques, people, places, etc I haven't fully been able to piece the entire story together in my own head quite yet. It has been overwhelming on many different levels. The following account will be more or less a stream of consciousness pulled directly from my own notes taken each evening on the bus ride home. Also, much of this post will be very specific and intricate details on the day to day operations of the restaurant. Those of you not in the restaurant industry may find it tedious or even boring - Sorry. I'm a cook. This will be from a cook's point of view. I will write the post in sections (just to humor my own OCD tendencies). 3) Nothing I could ever write here would come close to the things I've seen and experienced this past week. These pictures nor my descriptions will do the restaurant justice. Walked into work on day one at 8:45 in the morning. Really glad I had the insight to find the place before my first day! There is only way of knowing you've found the restaurant. After entering the town of Christianshavn, you make a turn down Strangade. After crossing several small bridges and warfs, winding your way through buildings and alleyways, and peeking around the hull of a large sailing ship you see the small lettering noma written on the wall in the low left hand corner of a large warehouse. Knife kit in hand, I arrived nervous of course, but doing my best to look as confident as possible. 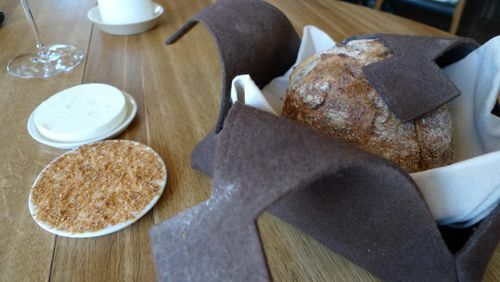 I had no idea what to expect, honestly one of the first times that has ever happened coming to a new restaurant - I usually at least have an idea. I found my way to the backside of the place where already a flurry of cooks in brown aprons were starting on the day's preparations, darting in and out of the two back doors. Worked up the nerve to ask one of the passing cooks where I needed to go for an apron and a chef jacket, he quickly pointed to the right most door. "Up the stairs, first door you come to. Ask for Ben." Upon opening the door at the top of the stairs, fifteen or so young cooks on either side of a long table running down the middle of the room turned to me. Each one had a tray in front of them and were picking various herbs and greens, most unrecognizable. "Uhhh....I'm looking for Ben." Out flew a man in the same uniform, black pants, white jacket, brown apron. Introduced himself in an Australian accent as Ben. "Why don't you head over here and grab an apron and jacket, and we'll get you started picking some herbs." Many of them I've never heard of let alone seen in a store. Thousands and thousands are used for the services everyday at Noma. They are picked fresh each morning. Most are gathered by the cooks or foragers from the local parks, beaches, and wooded areas around Copenhagen. There is a very specific way each is picked, and each has just as specific purpose. These herbs are used on nearly every dish, and the flavor, shape, and size of each as been analyzed to best fit it to the dish. Most things that are picked have various parts and each part is used for something different. The herbs are picked on a plastic tray. In front of you must be a container for waste, and containers for each part of the picked herb each filled with ice water. Only a small amount of the herb is brought out at a time so that wilting doesn't occur. Ever. -Chervil Stems - All the leaves are picked off the chervil until you a left with a bare wispy looking tree in the winter. These are used on the celery dessert. 300 are picked everyday. A cook picks 10 stems and a tally is made on a piece of paper. The stems can then be placed in the ice water. This continues until 300 stems are reached. The nicest leaves (the ones with body, life, and three leaves) are used for another dish, anything else goes towards the herb emulsion. -Sorrel - The leaves are washed, dried, and using a ring cutter perfect circles are cut from them. These sorrel disks are laid on damp paper towels. They are used for the savory cookie snack. Any extra goes towards a sorrel yogurt. -Chickweed - Small leaves are placed in one container, larger leaves in another. -Wild Ramsons (Ramps) - Large leaves are made into a sauce. Flowers are picked for garnish. Small leaves are used for garnish. -Lemon Verbena - Small leaves are used for garnish. Large leaves are made into a sauce. -Lemon Balm - Small leaves are used for garnish. Large leaves are dried for tea. -Watercress - Small leaves are used for garnish. Large leaves are made into a sauce. Stems are picked and poached in buerre monte for a dish. -About 20 or so others that I either can't think of right now or just haven't handled yet. Three meetings are held each day. One at 11am before lunch, one at 5:30pm before dinner, and one at 12am after dinner service. Every single member of the restaurant including cooks and waitstaff gather at the front of the restaurant to go through the reservations. Each and every single guest is discussed including their name, country of origin, connection to the restaurant, dietary restrictions and dislikes. Notes are taken on every guest by the servers and each chef de partie. Even things like "Mr. and Mrs. _____ have a tendency to order red wine with their cheese, let's be sure to offer them a few of our best..." Every service has several VIP guests many of whom are Michelin starred chefs. The lunch service on Tuesday had about 12 from all over Europe, and the president of Wine Spectator. Upcoming guests in the next two weeks include Michel Roux, Thomas Keller, and David Chang. Many of the reservations are read by one of the two managers and then Rene will make comments as needed. The meetings end with an enthusiastic Rene saying "Alright, let's do it!" followed by cheers and applause from the staff. On the first day at the lunch meeting, the three new stages were asked to step forward and give their names, country of origin, where they are working aside of Noma (Luce + Hawkins representin! ), and how long they would be there. No tape. No day stickers. No sharpies. All (by all I mean EVERYTHING) is labeled with a manilla label like the one below and must be written with black pen in clear english. On the label goes the name of the item, the dish that it is being used for, the date, and the initials of the cook that prepared it. While prepping, the immediate area around you is kept perfectly clean. Literally wiping down the area every couple of minutes. You never place product on a table. It is either on a tray, cutting board, or in a container. You never have more than one project going at a time. During service, the floors are swept on hands and knees with a dust pan and hand broom every five minutes. The windows and glass doors in the kitchen are sprayed and wiped clean every 30 minutes or so. The tables and plate up surfaces are cleaned between every table. The kitchen is scrubbed from top to bottom including the floor twice a day. After lunch service and after dinner service - I'm not going to get into the specifics. Let's just say it takes 30 cooks about 2 hours to clean a fairly small kitchen. Looks brand new after each cleaning. Each guest is given the choice of still water, sparkling water, or Birch water. The sap for the birch water is drained from the trees in a nearby forest, that also happens to be great foraging grounds. Same birch sap that goes into making the Noma beer. We'll be visiting the forest and the brewery tomorrow! Some of the friendliest and helpful cooks I've ever worked with. All are brilliant in the kitchen. Most were head chefs and sous chefs before coming to Noma - even the stages. Almost all have been at other Michelin restaurants before coming here and have incredible stories. I'm the youngest one there by far which is pretty cool. Most are from the Scandinavian area - a few are from Denmark. Most hale from Norway, Sweden, Scotland, Ireland, and England. One from Bulgaria, one from Israel, one from Mexico, one from Portugal, one from Poland, one from Germany. There are three of us from the US. I'm the only one from the East Coast. Because there are so many cooks from so many different countries, English is the only language spoken in the kitchen. The only communication in the kitchen is one of work. If you're not talking about prepping an item or how long it will be until you have a dish up, you are not talking. Period. Chit chat is saved for staff meal and the walk home. From the moment you arrive to the moment you leave, you are to be constantly moving. If you're seen standing around doing nothing for more than a few seconds you will be quickly reprimanded. The only time you are allowed to sit is during staff meal - about 15 minutes at 5pm each day. If you're not literally bounding up and down the stairs, you're not moving fast enough. It's constant and quick movement for a near straight 15 hours everyday. Not a whole lot to say here. The statement stands on it's own. An insanely busy lunch is 30 covers. An insanely busy dinner is 50 covers. Enough said. One of the wonderful tasks that we stages LOVE to do is walnuts. At Noma we get in fresh walnuts. The shells are cracked off. That's not the hard part. Then the nuts are quickly blanched and with a paring knife the membrane is carefully peeled off. That's right folks. The walnut membrane. Takes four cooks about 2 hours to do a small container. They are then ground and used for one of the desserts. On the first day, we got in six large containers of fresh in shell scallops. The shells were opened and the roe and guts were pulled and put in one container. The scallop muscle itself was cleaned and put in another container. They will be cured, frozen and sliced paper thin on a slicer. Then smoked and finally dried for one of the appetizers - goes with the watercress I mentioned earlier and beech nuts (cracked and peeled in the same manner as the walnuts). The roe is gently poached and made into an emulsion for another appetizer. The beards of the scallops are scraped and cleaned and braised for yet another dish. Whole peeled beets and celeriac are wrapped in a salt dough. Before closing up the dough, fresh hay is stuffed in with the vegetable, then baked. When pulled from the oven, the dough has hardened. It is cracked which releases the most haunting aroma. I can't even describe it. The beets and celeriac are then sliced paper thin for the musk ox dish. They have this incredible infused flavor of sea salt and hay. A combination that works beautifully with the earthy musty vegetables. Here's the musk ox dish with the hay baked beets and celeriac, smoked marrow (I'll get to that in a bit), and there's some of those sorrel disks I was telling you about. Yesterday me and three other cooks including Victor Wagman the sous cleaned about 12 cases of bone marrow. The marrow is pushed out of the bone with your thumb. The bones are saved for stock, and any extra marrow is saved for an upcoming dish: Bone Marrow Fudge. The cylinders are soaked in water for four days and then brined for one. Then, using a circle cutter they are all cut to exactly the same diameter, then sliced into disks, and laid in neat rows on parchment paper. Half are smoked for the musk ox dish, the other are left as is for the pickled vegetables dish. A cook spends an entire day working on this dish. The vegetables (carrot, beet, parsley root, celeriac, and shallot) are spun on a rotating mandolin. They are then sliced into strips and pickled, each in a different flavored brine. After a few weeks of that, each strip is taken by hand and rolled into a ring. Layers and layers are stacked with parchment paper. Just before service, a cook begins to assemble the pickle plates for the evening - it takes that long. When a pickle dish is fired, the plate is brought out, the pickles are glazed, several cooks begin to place herb garnishes, and lastly the seared bone marrow is placed. Just before each service hundreds of chestnuts are thinly shaved for this dish. When one is ordered, it takes so long to plate that it takes one cook to plate one chestnut dish. 10 cooks gathered around the pass, each working on a dish. The chestnuts are stood up, carefully leaned against each other like a house of cards. Peeled walnuts are sprinkled around. Then, cress shoots are placed one by one, the "V" of the cress perched on each slice of chestnut. 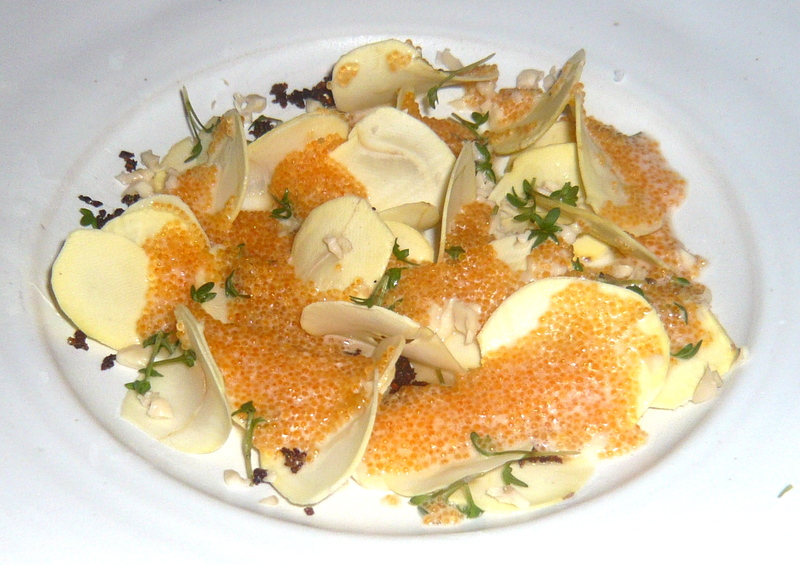 Later, bleak roe is spooned around the dish. This picture doesn't do the dish justice at all. Simply one of the most surprising flavor combinations I've tasted here yet. Sorry no picture. Ox cheeks that have been slow cooked for 36 hours are perfectly glazed and placed on plate with stalks of braised endive, razor thin slices of compressed pear, and a sauce made of lemon verbena. Inspiring. This incredible stuff is baked fresh daily and served in a handmade cloth sachet. Served with butter? Oh no. Noma sends out two different kinds of pork fat with the bread. One with local sea salt, the other topped with pork cracklings. I know the picture is difficult to cypher so I'll do my best to make some sense of it. The front line is contained in a small box that juts out into the dining room enclosed with glass on three sides. Rene or whoever is expediting for the evening stands in between the two plate up tables. Cooks on the inside are able to turn around and plate as well. On big tables, cooks line up and down both sides. There are no flames in the kitchen and therefore no loud hoods. Only induction and circulators. No ovens, everything is done in a pan. No heat lamps, the plate up table tops are heated - as food is plated it is warmed. And No ticket machines either, everything is called by a chef. There is nothing on the tables or cook tops. No shelves. Just clean and clear surfaces. All food prep is stored in the drawers under the tables. All plates are stored in warming cabinets under the plate up tables. All pots and pans are stored in cabinets under the induction burners. Since this kitchen is right by the entrance to the restaurant, all the cooks including Rene greet and say goodbye to the guests as they enter and leave the restaurant. I am ecstatic and honored to be able to say that I have been given the opportunity to work a station during the services at Noma. Each guest's meal is started with "snacks". The first six courses or so of their meal. These are small plates about one or two bites used to excited the guest's mind and palate. All are finger foods and so they make the guest comfortable. 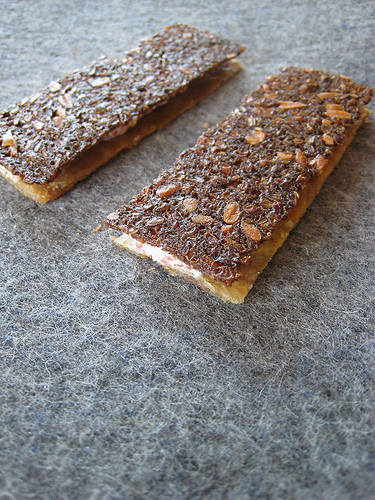 The first is a leather made of sea buckthorn and carrot. It is cut into a perfect square,pinched from the middle, and stood on the plate. It is dressed with three pickled rose petals, a spray of rosehip reduction, and a sprinkle of sea salt. The next is a savory vinegar cookie. 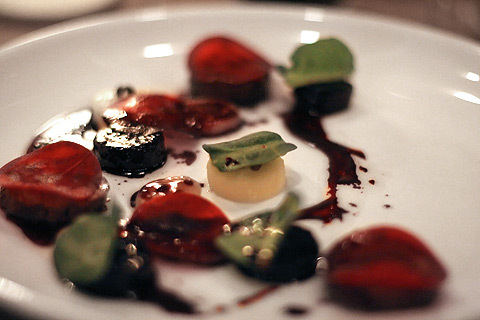 On it is placed a disk of sorrel and speck fat that has been coated in a powder made of dried blackcurrant. On top is a piece of young pine. 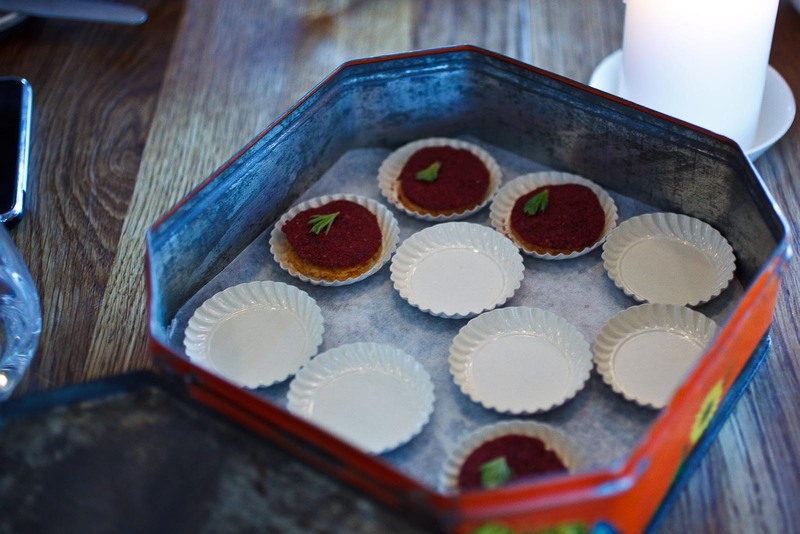 They are served to the guest in an antique tin. 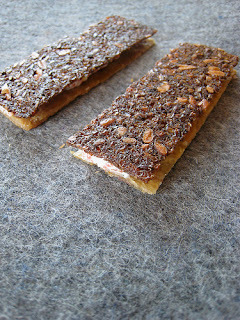 After the cookie, a sandwich made of baked crispy chicken skin and toasted rye is sent. 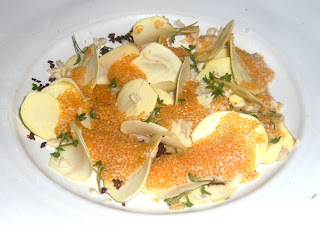 Inside is a mixture of smoked Danish cheese and lumpfish roe. Delicious! 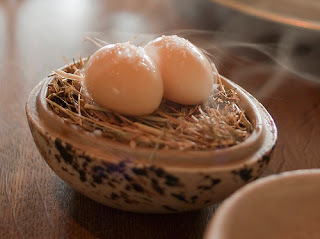 Next is a quail's egg that has been soft poached and then gently smoked. They are warmed in a circulator with a acidic brine just before being sent. The eggs are placed into a porcelain egg stuffed with hay. A bit of sea salt is sprinkled on top. Just before it goes out, a smoke gun pumps hay smoke into the egg. When the lid is lifted, the aromas of smoked hay fill the air around the guest. The egg bursts in your mouth like caviar. Next is local Denmark radishes. A herb emulsion is foamed into the bottom of clay pot with a nitros canister. Next a "soil" made of malt flour, butter, hazelnuts, and beer is sprinkled over, lastly salted radishes are placed into the "soil". 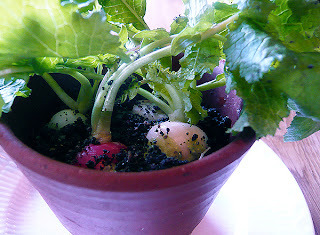 Guests are instructed to pull the radishes from the dirt and dip them back into the emulsion. One of a kind experience. Last is a piece of buttered toast. Dots of cod roe emulsion cover the toast. Then about 11 different types of herbs are stood up in the roe until a small forest is created. The toast is then dusted with a vinegar powder. For VIP's a piece of "duck skin" (A chip made from reduced and dried duck stock) is placed on top of the herbs. The herbing process is so tedious and takes so long, that there are two cooks that do nothing else for the service. Each week the cooks are encouraged to work on a special project of their own. They are presented to the other cooks at the end of Saturday night clean up. All the cooks gather around the pass. The presenting cook prepares three plates of his dish, then explains the components and thought process. Then we all get to try it! Rene and the other sous chefs offer their critique and opinion on the dish. Rene calls these sessions "tryouts". Often times, a dish that is liked by all will make it to the menu. How incredible is that? Probably the most memorable part of the entire week. I find myself with the other cooks at 1:30 in the morning, gathered around the Noma pass, listening to Rene Redzepi critiquing one of his cooks dishes, telling him that he would like to see it on the menu within the next few months. Absolutely amazing. Afterwards glasses of Noma beer are poured and a cheers is made to the great week we had. I walk home at 2:30, about to fall asleep and feet burning, but more inspired than I've ever been in my life. What a great description of food heaven. It sounds magical but exhausting. Jesus christ, Taylor. I would like to think that I could pull it off there, but I know I couldn't. Constantly in awe of you. I had it all, total magic, loved every bit.